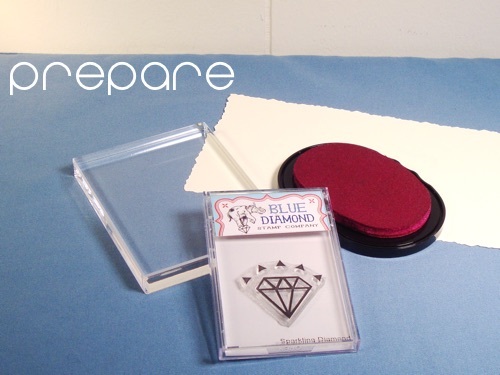 Stamping Basics — Blue Diamond Stamp Co.
Before you begin, make sure you have a good even flat surface to stamp on. Using a stack of paper, a magazine, or mouse pad can give your table some protection from any misplaced ink and provide a little spring. Some stamps make instead work best on a hard surface, so it is best to always experiment. Keep an eye out for any lumps, bumps, or sags that may cause a patchy print. To use, clear stamps need to be peeled from their index sheet and placed on a clear acrylic block. The ideal block mount should be slightly larger than your stamp. They will naturally cling together, so there is no need for any glue or other adhesives. Press to make sure it is well adhered in all areas. Place your inkpad face up on the table and dab the stamp straight down on it. Do this several times, moving the stamp around on the pad. The goal is to get a good even coverage of ink on the stamp. Take a look at your stamp’s surface briefly after inking to see if any areas appear dry and need more ink. But don’t press too hard, as any excess ink may build up on the edges of the stamp and transfer on your print. Decide where you want the stamp to go and carefully set it down. Press down on it evenly but be careful not to rock or readjust it as this will cause the image to be blurry. Carefully lift the stamp straight up off the surface as any side to side movement may cause a shadow image. 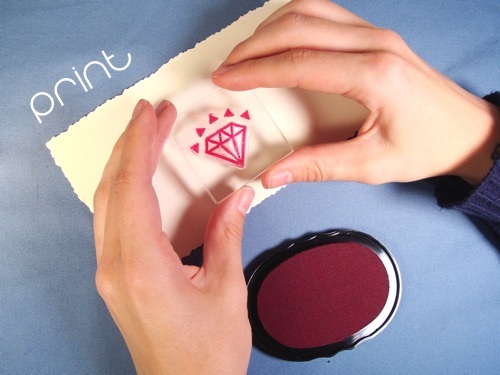 Let your stamped image dry before touching it or coloring it in. Different inks and surfaces will require longer or shorter drying time. Some may even need to be heat set. Check out more information about inks and materials. If you want to stamp another image, you will likely need to re-ink the stamp first to ensure even coverage. Remember all inks and specific stamps, depending upon their size, may handle a little differently. It is best to experiment first before using it on your final project. Feel free to contact with any questions about using your stamps or other tips you would like to share! Click here to learn more stamping tips, how to select an inkpad, and about working with unique materials.